The campus of the University of Technology stands on part of the site on which the Hope Farm and the Farm School were established in 1910. 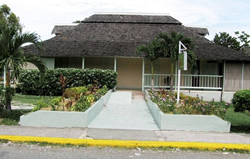 The School was established on lands which were part of the Hope Sugar Estate. Built around 1912, the building which houses Lillian’s Restaurant stands as a charming bungalow with features of the Georgian and the Vernacular style of architecture. The building rests on reinforced concrete plinth and has a wrap-around verandah which has been enclosed by wooden columns, balustrades and high level vertical louvers as vents. The structure is crowned with a hip roof with shake finish and projecting dormer on the left side. The dormer in the roof has wooden louvers for ventilation and matching roof shake material. 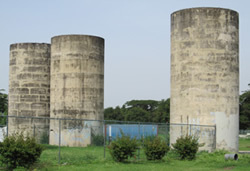 Located at the north western corner of the University of Technology Campus are the three concrete silos, which were built between 1920 and 1930. The ladders leading to the top and the roofs have since disappeared from the structures, but the concrete towers continue to stand as reminders of installations at the Hope Farm where modern cattle breeding began.